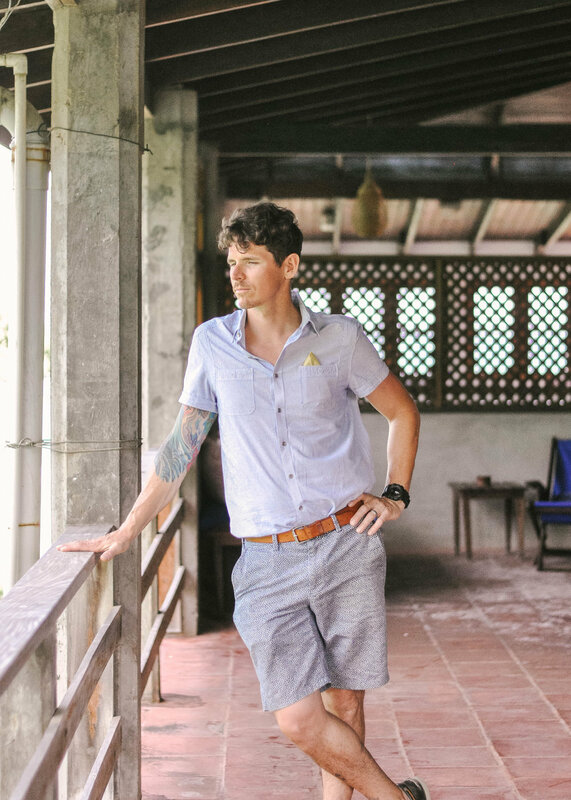 I want to preface this by saying how much we always love talking hotels with you guys and offering honest, thorough reviews of the properties we're visiting all over the world. As a well-traveled woman, I consider myself somewhat of a hotel accommodation connoisseur. I get that from my mom. My mom has long loved finding exceptional or noteworthy hotels and accommodations around the world, luxury and otherwise, and then experiencing exactly what makes them so magical, and will often choose a destination solely based on one extraordinary property that she just has to visit or revisit. We absolutely love to travel, explore and adventure and are happy to rough it and go without if the juice is worth the squeeze. But there's always been a very special place in my heart for properties that find a way to marry style, service, warmth, comfort, amenities, "vibe" as Chris would lovingly call it and location so perfectly that you're unexpectedly and joyously moved with immense pleasure, satisfaction and contentedness after your stay. And when I research potential accommodations for any trip we take... at length... this is what I'm looking for. Those diamonds in the rough. 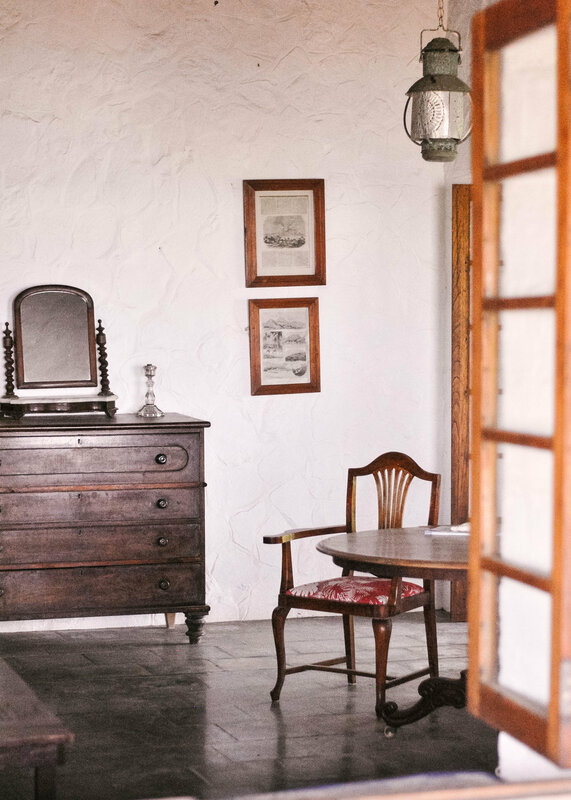 Those properties that are so comfortable, cozy and perfectly peaceful inside and out that it feels like you've been transported to another time. A simpler time. Actually forget time. Time ceases to exist in these spaces, and that suspension is where nirvana exists. This, my friends, is what we discovered when we arrived at Sugar Reef on the island of Bequia (pronounced Bek-Way). Nirvana. 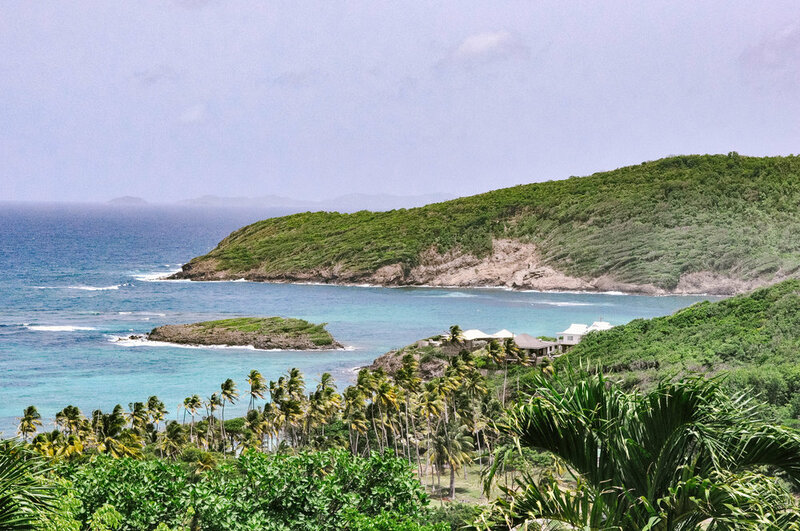 Before we happened upon Sugar Reef in our Caribbean travel research, we didn't even know Bequia existed, and neither did any of our American friends, it seemed. Which intrigued us. 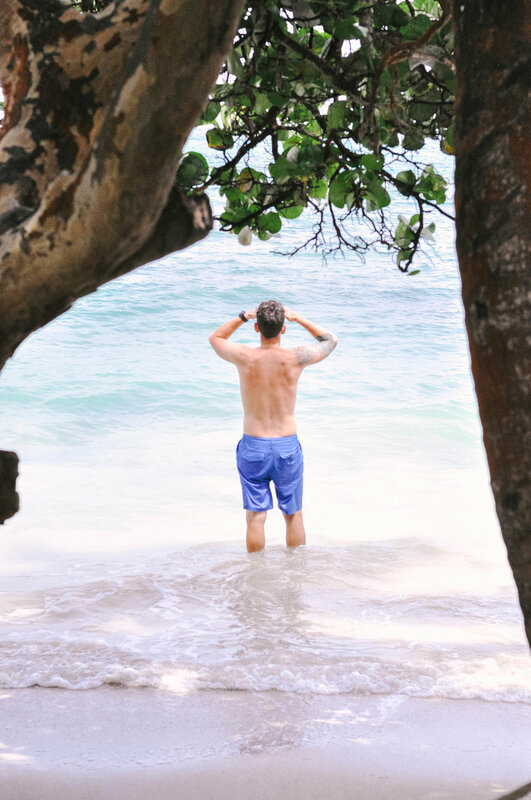 Then, there was THIS Telegraph article in which the writer made a very convincing case for why Bequia could quite possibly be the most perfect Caribbean island. And intrigue turned to must-go. When Sugar Reef somehow arrived on our radar during further research and offered secluded beaches; unobstructed views of the Grenadines; rustic, peaceful, airy accommodations and world-class cuisine with fresh, locally sourced ingredients at its core; we knew something special awaited us on this island. 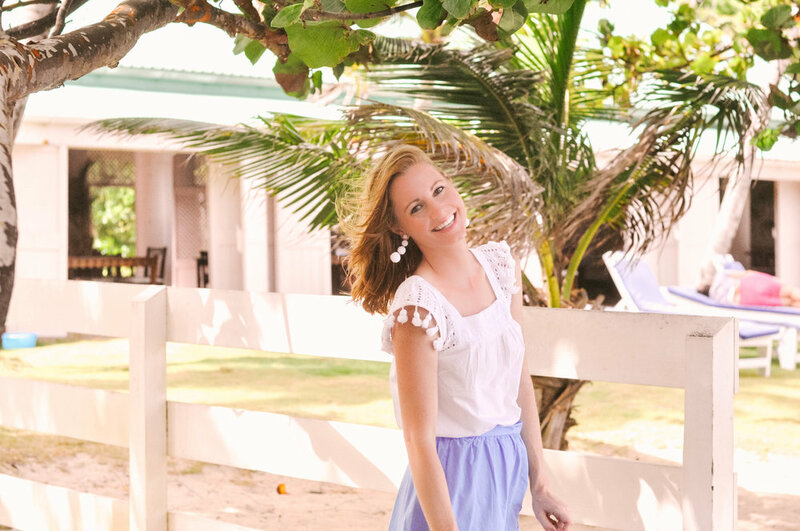 When you arrive on the island itself, you're immediately greeted by sparkling turquoise waters, an inviting, warm breeze and friendly, smiling locals. And this feeling of warmth and welcome was only elevated when we arrived at Sugar Reef (via the most fun open-air taxi truck we've ever taken -- an amazing way to enjoy the perfectly temperate weather and see the island) and were met by Tatiana, one of Sugar Reef's lovely staff members who just oozes effortless island elegance. 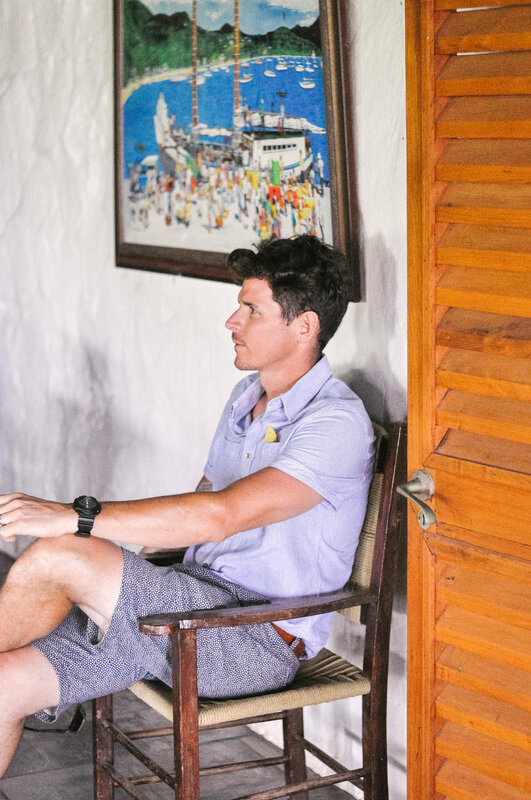 Tatiana first assured us that check-in is easy and informal at Sugar Reef, and that as a guest here, life is casual and without expectation or agenda and that we should relax as little or as much as we felt so compelled to do. Sign us up! She then gave us a brief tour of the hotel's acclaimed Beach Cafe, great hall and Beach House lounge area and showed us to our room at the Beach House, which is one of three guest rooms that resides on the beachfront portion of the property. The very first thing anyone will notice about Sugar Reef upon arrival? 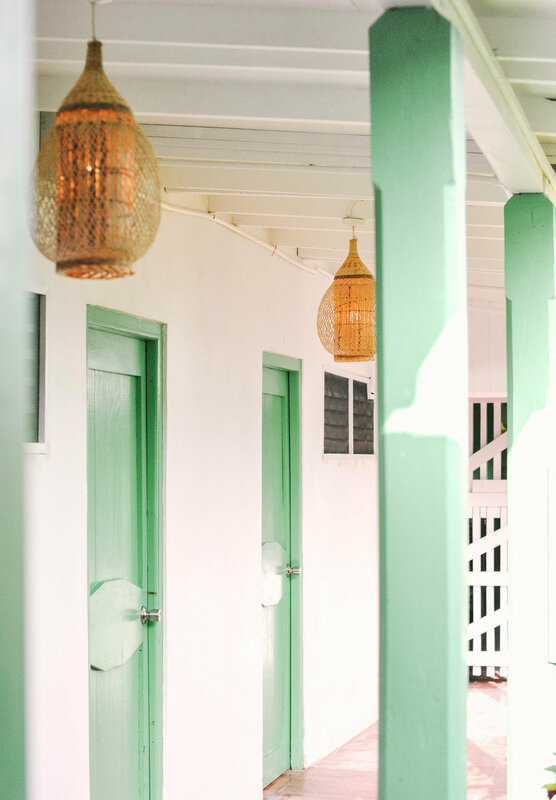 The perfectly appointed, beach-chic decor that drapes every inch of the lounge area, Beach Cafe and guest rooms in gorgeous rustic-meets-mid-century-decor that immediately feels like all of your stylish, Caribbean dreams come true. But more on that later. After we emerged from our room settled and ready to explore, Jeff, the hotel's resident bartender who seems to magically materialize behind the bar at any hour of the day, offered us a "welcome" rum punch and we immediately realized that we had, in fact, found Hotel California. Sugar Reef as a whole is actually a 65-acre estate comprised of two nearby locations: The French House, which is located high upon a hill of their sprawling coconut plantation, and the Beach House, which sits on its own private quarter-mile-long beach, with (as promised) secluded, tranquil views of Crescent Beach and Industry Bay and the Grenadines in the distance. 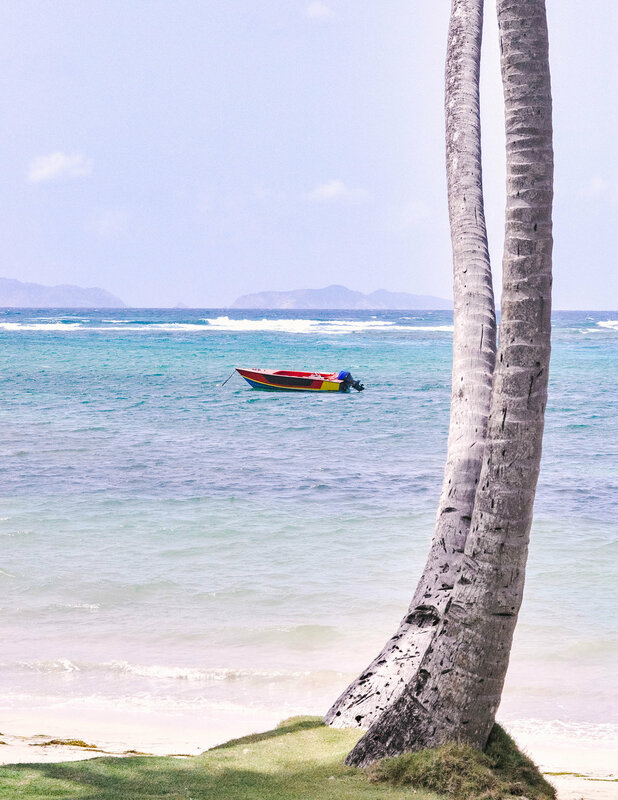 You’ll find comfy Adirondack chairs to sit undisturbed, rum punch in hand, taking in those views for hours on end. 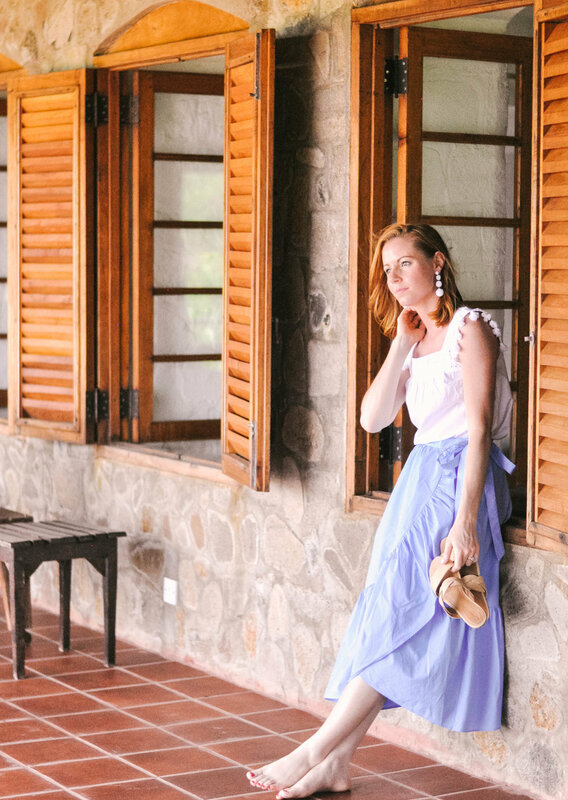 As we arrived in late May, it was the off-season for Caribbean travel and we were able to enjoy our stay at the Beach House with the only two other couples that were in residence at the time while the French House remained unoccupied. But because at Sugar Reef no request is off limits, the hotel's jovial and extremely knowledgeable General Manager Judit (pronounced You-dit), a Hungarian transplant who found love on Bequia (naturally) and now wholeheartedly embraces island life, was kind enough to take us up to French House and give us a tour of its dramatically romantic, castle-like grounds that offer what are some of the island's most impressive views. 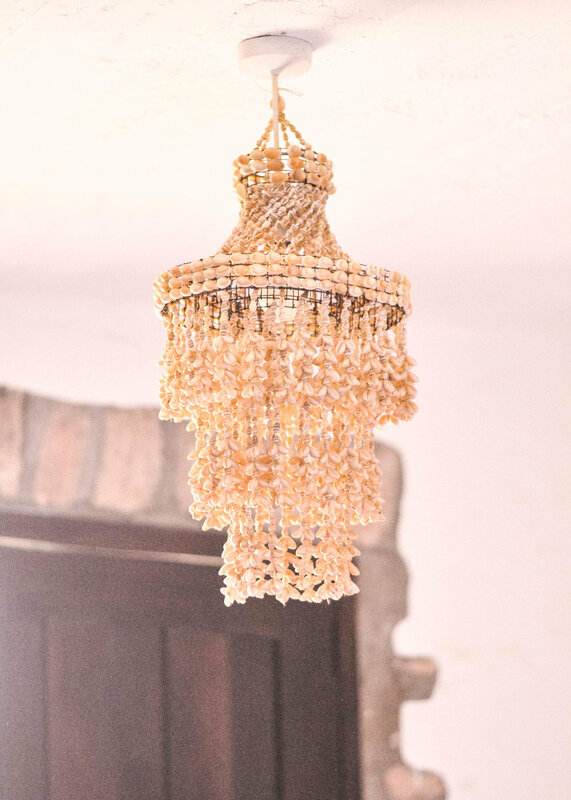 But back to the decor because, as I mentioned, upon arriving at Sugar Reef the stunning decor is one of the first things you notice and is something about this place that will forever be at the forefront of our minds when we remember our time there. 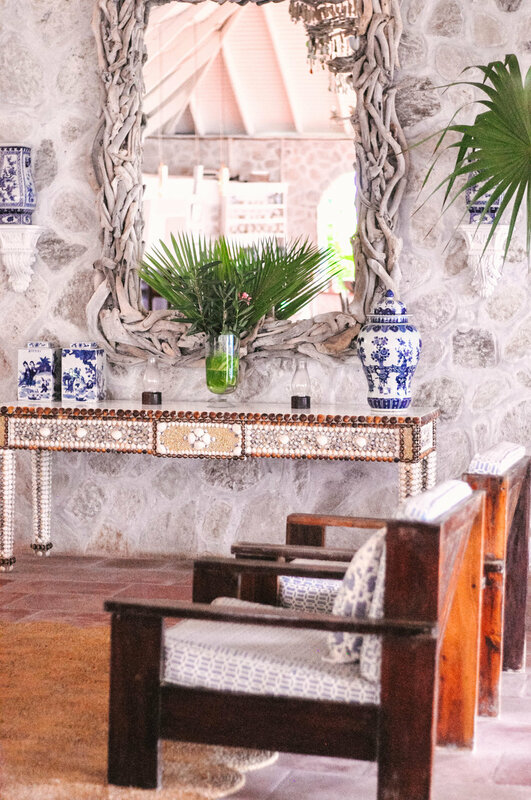 In addition to staff and service, I've always felt that decor quickly and clearly sets the tone at any hotel, and at Sugar Reef, it's very apparent that the decor, expertly curated by interior designer Jonathan Berger, wasn't an afterthought and was carefully woven into the fabric (both literally and figuratively) of the property as a whole. In the great hall of the Beach House, whitewashed stone walls, traditional blue and white Chinoiserie jars, large driftwood and sea glass chandeliers and art pieces by artist Ben Forgey, white vaulted shiplap ceilings, woven seagrass rugs, and doors that line the beach-facing wall and open the entire room up to unadulterated views of the ocean simply radiate a relaxed, beachy ease that invites you in and welcomes you to curl up on a settee barefoot and waste away the day with a spiced rum punch in hand and a card game for two. This eclectic, island-inspired decor is carried into the beachfront guest rooms in the Beach House, oozing a sort of old-school-West-Indies meets mid-century-Caribbean-luxury vibe with large armchairs for resting and reading, more white vaulted shiplap ceilings and plantation doors that take you right out onto your own private patio and sitting area and a beachfront hammock perfectly placed in the shade on the shore. Also of note, and certainly not of little importance, was the fact that our four-poster bed and soft white linens were extremely comfortable and offered us the most restful honeymoon sleep as we were lulled into dreams by the crashing waves and the cool ocean breeze blowing through the open slats (that were all covered by mesh screens keeping the bugs at bay). 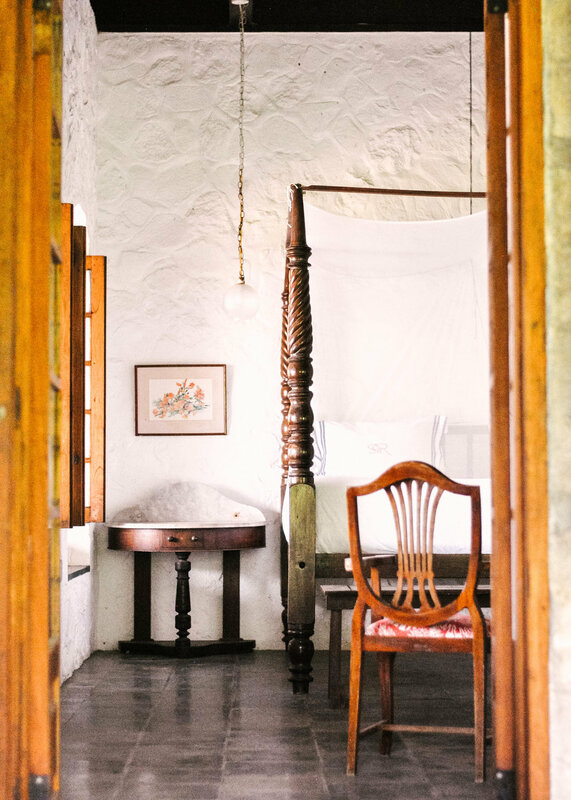 Up at the French House, the same natural, easy-breezy elegance applies, but the common area and the five rooms there include more of a nod of Bequia's colonial history, with antique touches around every corner that offer guests a reminder of Bequia's rich seafaring history and transport you to another era. 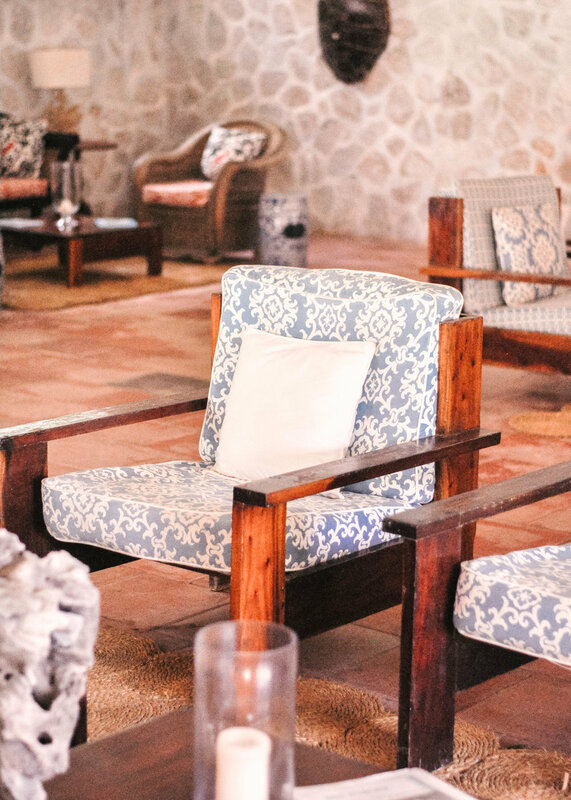 Substantial and beautifully crafted furniture pieces appear in every room, much of it made from rich, dark mahogany sourced from the island. 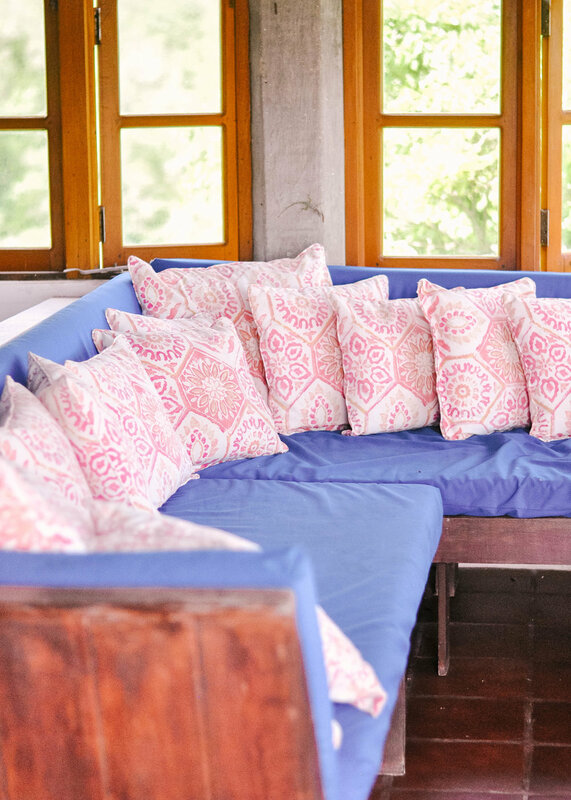 Like the Beach House, the French House includes its own vista to take in breathtakingly unobstructed views of the bay via a large patio filled with lounge chairs and cozy corners in which to curl up. And of course, there's a hammock there, too. French House also includes its own plunge pool exclusively for the guests of French House to enjoy, as well as possibly our favorite room on the entire property, the master suite that includes a romantic mahogany bed, its own beautiful en suite bathroom with a large natural stone shower and a private staircase down to the plunge pool and garden. This would be the perfect room for a honeymooning couple, and Chris was sure to let me know that when we come back to Sugar Reef, this is the room we have to try. Not found anywhere at Sugar Reef are any TVs on walls, clocks, air conditioning, in-room Keurigs, electronics of any kind or other items that would disturb the property's peaceful island vibe. And if that turns you off, that's absolutely OK. Sugar Reef is honest about the kind of traveler the property and its amenities serves and what you will and won't find there (check out the candid "Go or No" section of their website). If nature scares you, this isn't the place for you. If the cool night breeze isn't enough for you and air conditioning is simply a must, this isn't the place for you. And again, that's all OK. 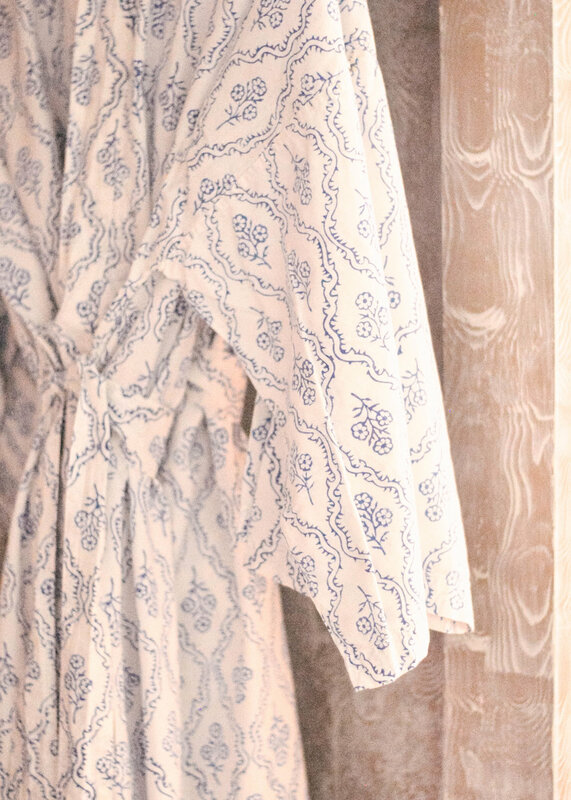 There are a thousand reasons to visit Sugar Reef, and an abundance of modern conveniences isn't one of them. I'm currently reading the Little Book of Hygge which outlines the Dutch's proclivity for happiness and its tie to their perpetual search for "hygge", the feeling of coziness, charm, relaxation and bliss both in moments and decor. And if this place isn't "hygge" (hyggeligt? I haven't quite mastered the conjugation of hygge yet), I don't know what is. 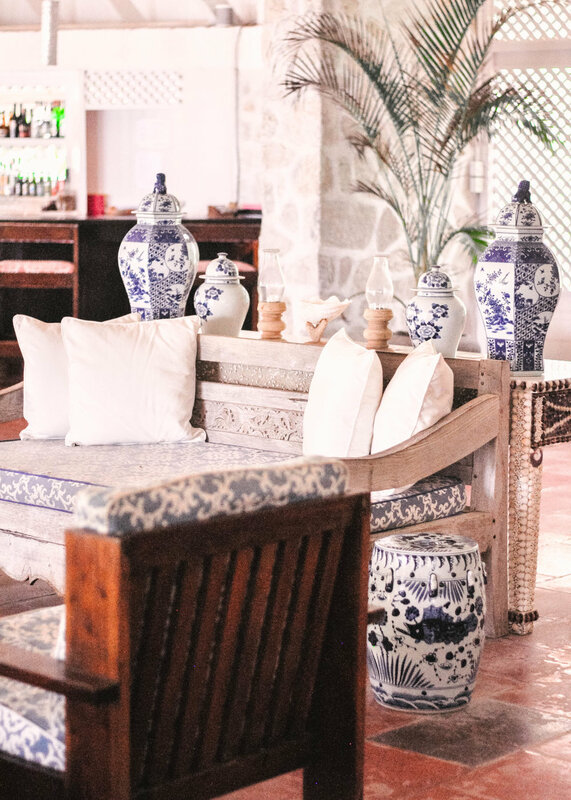 In addition to the ambience provided by the decor, two of the thousand reasons to visit are things we loved most about Sugar Reef's offerings: the location and the food. We have another fun post planned for next week that will outline our activities on Bequia and all of the fun and adventure the island offers, but as far as Sugar Reef itself, the location offers the perfect position on the island to enjoy the secluded splendor of the immediate surrounding area, and easy access to Port Elizabeth, the island's bustling harbor and "downtown", should your adventures take you that way. 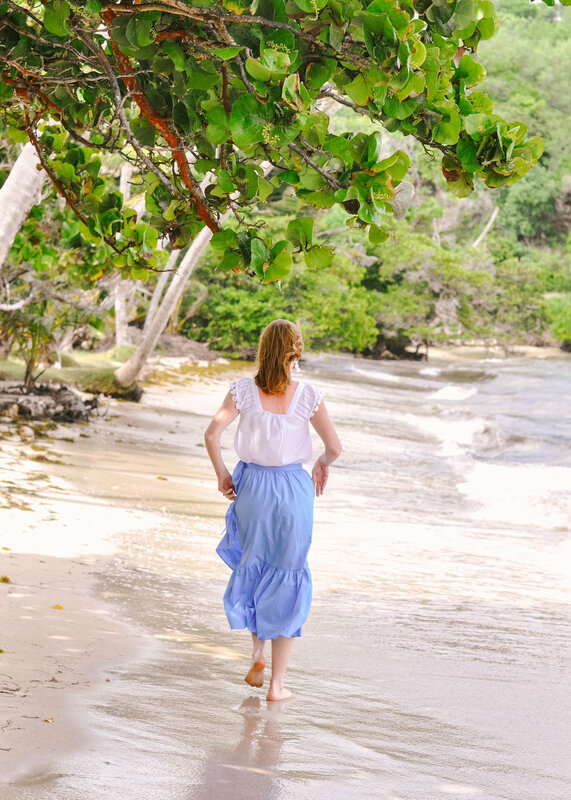 Just a short, tranquil five-minute walk from Sugar Reef sits one of the island's coolest attractions, the funky little Old Hegg Turtle Sanctuary, or as I call it, Heaven on Earth. Not only does this turtle sanctuary house, nurture and protect increasingly rare and majestic hawksbill turtles in an effort to conserve their dwindling population (yes, you can touch all but the babies), the owner also runs a farm of sorts, complete with tiny goats and 37 adorable dogs in residence. 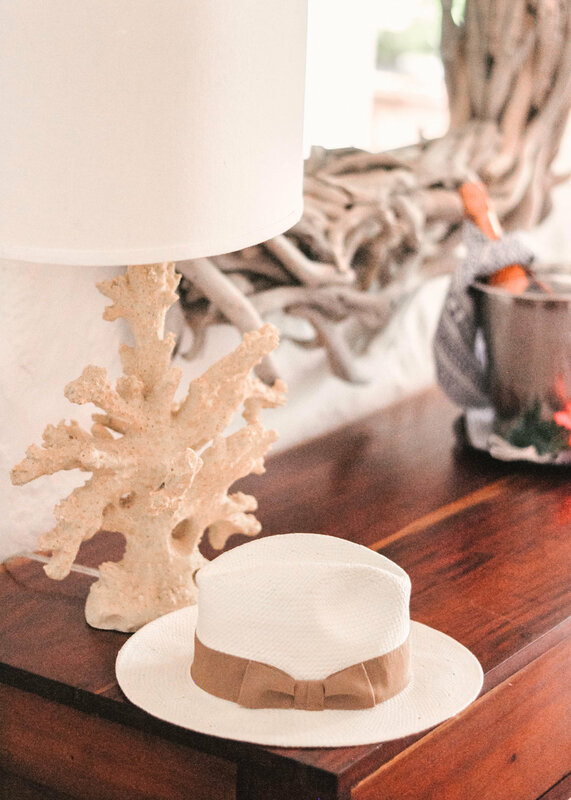 The entire property sits on a cliff overlooking the ocean, and walking there from Sugar Reef and visiting this island respite was one of my favorite travel experiences to date. And again, those views. As for the food, well, exceptional doesn't seem to quite do it justice. Before our stay at Sugar Reef, we'd repeatedly read that the food served at the Beach Cafe was some of the island's best. And yet we wondered how this was possible with such an intimate staff and a relatively small, remote operation. But what we found was that “locally sourced” isn't a trendy buzz phrase that Sugar Reef uses to attract eager foodies to their little island outpost. It's simply a way of life. 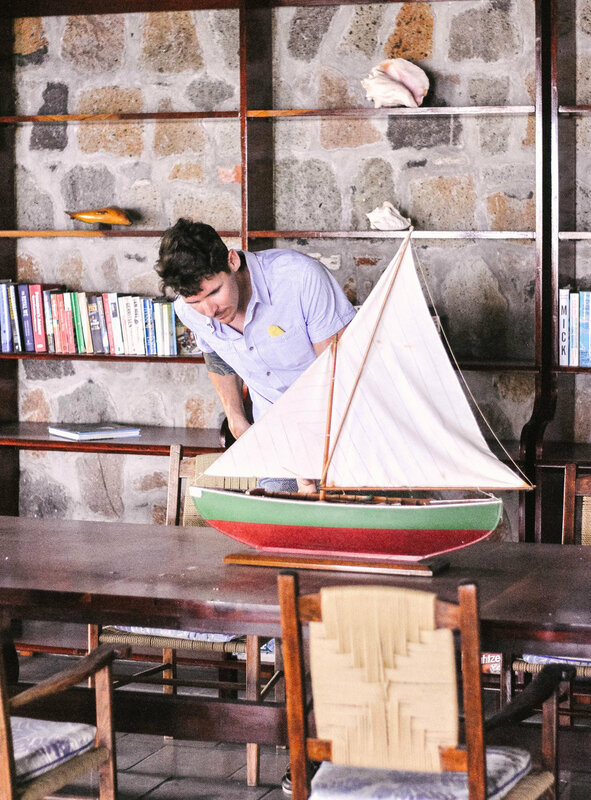 Once you see the boats in Port Elizabeth and all of the effort it takes to load them up with the essentials and ferry them to the island, you start to understand why Sugar Reef maximizes the estate’s production and use of their own honey (yep, there's an apiary on property), fruit (we now find ourselves constantly craving fresh mango), coconut oil, milk, local fish, meats and vegetables. It's not only a necessity, but they live the idea that the fresher the ingredients, the better the cuisine, and that's just ingrained in their DNA. And it doesn't get much fresher than something plucked from a nearby tree or hive. In the morning, we were served a complimentary breakfast of granola, yogurt, fruit and of course, some really fantastic coffee and the most insanely delicious, freshly baked banana bread you've ever eaten. That's an island staple, but Sugar Reef's is particularly tasty. Lunch is served at the cafe every day basically any time you're hungry and dinner... oh the dinner. With the lights down low and candles to illuminate the cafe, and the small dinnertime staff floating from table to kitchen and back again, we've never experienced a more perfectly intimate dinner. After bellying up to the bar and sharing stories from the day's adventures and getting better acquainted with our fellow guests over pre-dinner drinks that Jeff expertly crafted, we all decided to continue the conversation and break bread at one table to share in the experience together. And what an incredible experience it was. Chris and I started by sharing the utterly delectable tangy callaloo soup that was filled with beans and vegetables that we couldn't even see well enough to identify, but relying only on our palates was the perfect way to enjoy these creative Caribbean dishes. Next, we shared the fish of the day dish, which happened to be a fresh, moist and flaky blackened mahi-mahi with a crispy and spicy crust that didn't even last for five minutes after it arrived on the table. And even though everyone was entirely satisfied after our main course, the charming British couple we dined with convinced the rest of the group that the ice cream with toasted coconut sprinkles was absolutely essential. And they were right. It was a sinful, sugary delight that we already knew could never be replicated once we got back to Phoenix. Jeff, who doubled as our dinner server, cracked up at how silent our once boisterous table suddenly became once the ice cream came into play. 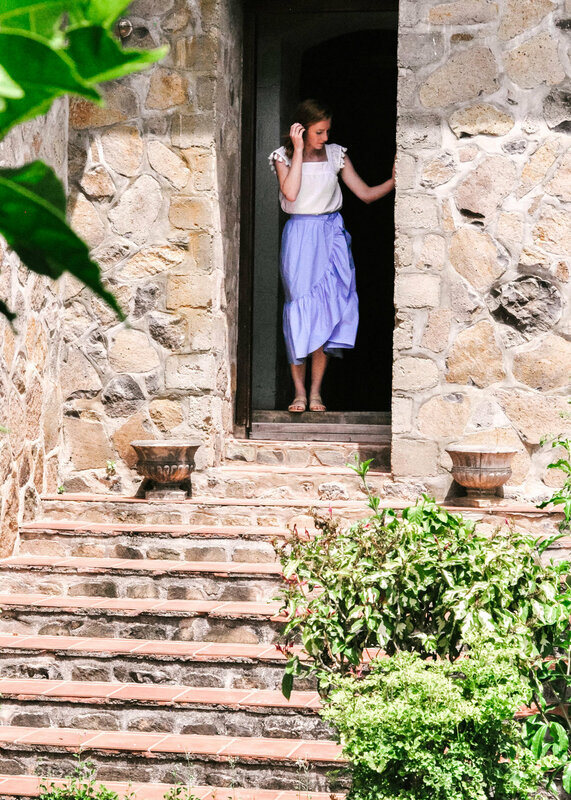 And speaking of the service, it's particularly astonishing that while the hotel itself may be casual and informal in nature and philosophy, the service displayed by the staff certainly is not. In fact, we've talked about how we don't think that we've ever seen such an elevated level of service anywhere we've stayed, which as an avid student of service, Chris is at once impressed with and fascinated by. From the moment you arrive, every staff member makes it their mission to know your name, your story, your preferences and any items on your activity wish list. All are seemingly always available to personally attend to your every need, and no request is too large or too small for any member of their staff to see to. They somehow have a hands-off approach while remaining totally and completely attentive. Judit, who oversees all operations, Sharn who serves as both meticulous housekeeper and kitchen maven, Tatiana, the savvy local who can accommodate any activity or transportation request with a simple phone call and Jeff, who tends bar like a seasoned pro are all warm, inviting, soothing presences at Sugar Reef, yet they offer the kind of perfectly polished hospitality that you'd expect at any of the world's top luxury hotel properties but with more consistency. 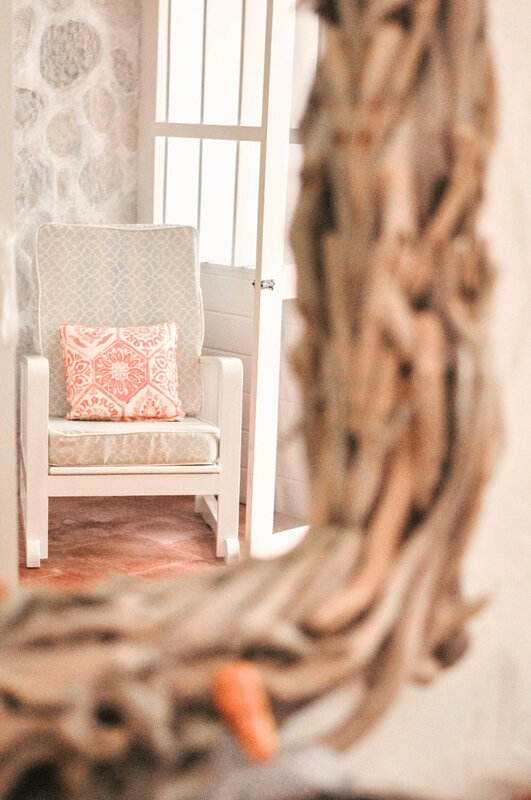 Simply put, Sugar Reef is altogether stylish, peaceful and makes you feel like God's hands have ever-so-delicately painted this perfect picture on the shores of Bequia, just waiting for all of us. You only have to pack your bags and set sail (literally) to enjoy the bounty of its beauty.